Over the next two weeks, I have been invited to participate in a daily bible study entitled “Women of Influence.” This study is part of a “Mentor/Leadership” program hosted by Good Morning Girls. Sixteen, enthusiastic ladies, are rising in the darkness and silence of the wee morning hours…. our goal: To meet with God and Kesha, our Mentor, to receive training on how to effectively lead an online study group. The demand for online leaders is growing at goodmorninggirls.org. Over the next 14 days an estimated 120 women will participate in this leadership training across the globe. The current session which I am in is Luke 1-8. This insightful study has been translated into 13 languages and currently has over 650 women participating online. The winter session runs from January 15th until March 15th. We will be taking a two week break and then continuing on in the book of Luke 9-? on March 25th. That being said, today is the first day of the Mentorship program. Each day we are assigned scripture to read and meditate on. We then share what the Lord has placed on your hearts with the other ladies in a private online forum. The very first verse is….you guessed it….Titus 2:3-5!! Yeah!! Below you will find some thoughts that I shared with my online study group. I would love to hear your thoughts on this verse as well. Too often this command is taken lightly or ignored completely in today’s church. This is so sad, as we are “commanded” as older women to train the younger woman, less they are doomed to possibly making the same mistakes. Right up front, Titus addresses who I must be, before I step into the role of “older women.” First and foremost, I must be a reverent women, not a slander/gossip, sober (not addicted too much wine or anything else for that matter), and finally a teacher of good. We can be the teacher of ungodliness as well, through unchecked sinful actions, bad thoughts, and attitudes. Ultimately, our goal is to start in on the training of the younger women. This passage is quite specific in these areas, not leading anyone to guess the “older woman’s” responsibility. There are seven specific areas in the training of the younger woman. These are areas that,over time, gently transition the godly younger woman into the godly older woman. I encourage all ladies to embrace the season they are currently in, as the seasons are passing more quickly the older I get. Do not just “sit, soak, and sour” your life away. Start today…live your life consciously!! Walk in God’s perfect plan for you. Let’s run the race well! Let’s finish the race well!! Your crowns in Glory await you….to cast at the feet of Jesus. I am just wondering what the gathering is all about? Our church’s Women’s ministry uses this scripture as our mission. 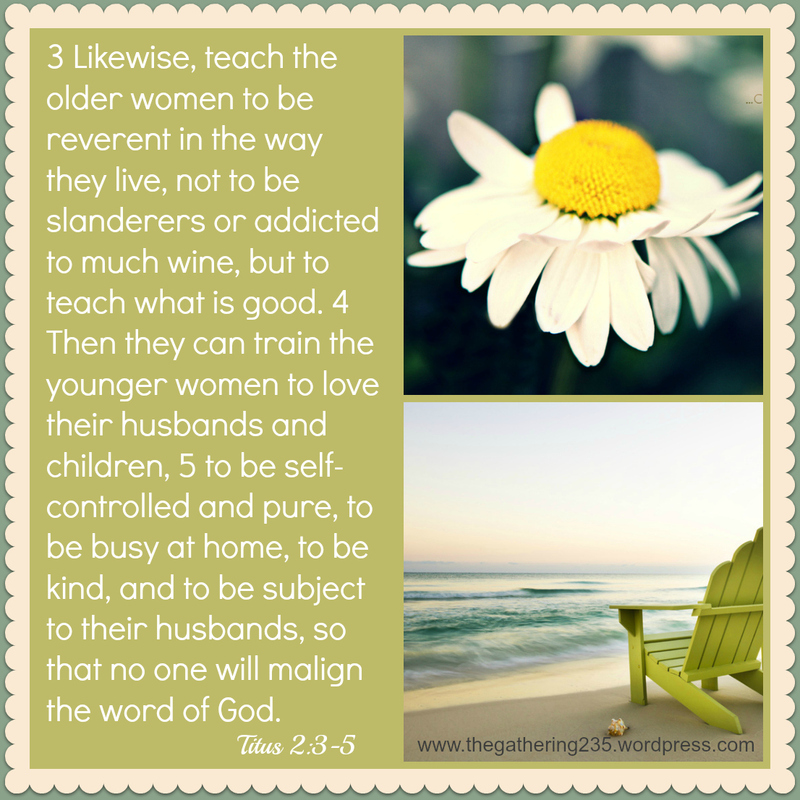 Our desire is to encourage older woman to teach the younger woman as commanded in Titus 2:3-5. It is so great to hear that your church takes this command seriously. I had received many messages of discouragement regarding this command NOT being obeyed in the local church. Younger women are hungering for Godly teaching from older. No matter what our age…there is always someone younger then we are. It is wonderful to establish relationships with other women who can encourage and build each other up. There are practical life lessons to be taught as well was biblical lessons. I will quote Dr. John Whitcomb,” Be one, teach one.” That means…be a follower of Christ and teach a younger follower of Christ what we are learning through our time of His Word on a daily basis. Thank you again for your comments and please like us on Facebook if you would like to join in the fun!